Just one day after Turkey’s announcement of plans to invade Syria by implementing a “no-fly zone” or “buffer zone,” Jordan has now announced that it is consideringdoing the same. While the Jordanian military would obviously be involved, the zone would largely be manned by terrorists receiving support from the United States and the West. Despite the fact that the “buffer zone” is being given the coloration of a humanitarian effort to end the fighting, protect the Jordanian border, and provide an area for refugees to gather, the fact that the Free Syrian Army fanatics and other “anti-Assad rebels” known to civilized humans as cannibals, rapists, and murderers, is a clear signal that there is nothing humanitarian about this measure. Indeed, a true “buffer zone” would be manned by foreign military or peacekeeping forces. Allowing jihadists – parties to the war in Syria – to man the line is a complete abrogation of even the slightest attempt at public relations. Thankfully for the Jordanians, no one in the West is paying enough attention to see through their façade. Turkey has long been a proponent of a buffer zone in Syria, as have other NATO countries. The establishment of a buffer zone, of course, would simply be a repeat of the Libyan tragedy, the very goal of NATO and the United States for Syria. The Telegraph has also reported that Turkish media was briefed on the orders, suggesting that the military was preparing to send a force of about 18,000 soldiers across the border. Some reports suggested the attack could come as early as Friday. The goal would be to seize territory 60 miles across and 20 miles deep in Syria, as well as the border crossings of Aazaz and Jarablus. Such a buffer zone would provide an even deeper Forward Operating Base inside Syria from which to launch more and more terrorists to fight against the Syrian Army both from the north and the south. Interestingly enough, the Jordanian plan comes right on the heels of the Turkish announcement proving that either the relationship between Atlanticist goals and fortuitous coincidences is still unparalleled, alive, and well or that the announcements were carefully coordinated as part of an effort to destroy the secular government of Bashar al-Assad and weaken the resolve of the Syrian people. Such an announcement comes on the heels of a series of victories by Assad’s forces, backed by Iranian and Hezbollah fighters, in the Southwestern front, particularly in the city of Deraa. A buffer zone, of course, has been part of the NATO agenda against Syria since the beginning of the Western-controlled crisis in the country. Remember, it was under the guise of a humanitarian corridor or buffer zone in Libya that NATO bombing took place which ultimately led to the destruction of the Libyan government, the murder of Ghaddaffi, and the subsequent expansion of chaos, anarchy, and genocide across the entire North African country. Recently declassified documents from the Defense Intelligence Agency also show that not only was the United States supporting ISIS and al-Qaeda in Syria and Iraq but that an attempt to set up a “buffer zone” was also in the cards. At the end of the day, it is important to remember that any attempts by Turkey or Jordan to create a “buffer zone” inside Syria are nothing more than a farce. 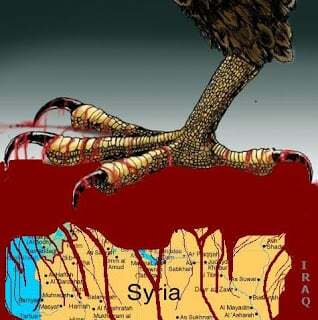 The death squads running amok in Syria are themselves entirely creatures of NATO and they remain under NATO’s command. The true enemy of ISIS, Khorasan, and the cannibals of the Levant has always been and continues to be Bashar al-Assad. Any attempt at weakening Assad is a clear reminder that NATO is providing direct support to ISIS and its related terror organizations. Make no mistake, a buffer zone in Syria will have the same effect as the buffer zone in Libya. We must do everything we can to make sure there is no Libya 2.0.